A Practical Bike for Tokyo. Its a proud day for a dad when his daughter asks for a mountain bike for her 10th birthday which is just what my daughter did in September. She had had her eye on the girls Hotrock 24 at Garage Takaido for a number of months prior, so thats what we got. Suffice to say she was stoked. 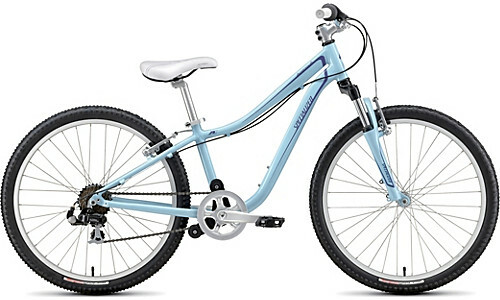 Specialized Hotrock 24 Girls MTB. On her first ride you could see she was loving the big bouncy tyres, the light frame and front suspension. Rather than sitting constantly in the saddle she was standing and cranking down on the pedals and speeding off into the distance. Instead of avoiding bumps, obstacles and potholes she was seeking them out. Instantly her cycling experience changed from being transport to being fun. It was only a few days later, however, that we discovered that a mountain bicycle is not the ideal bicycle for a city like Tokyo where cycling is primarily transport. 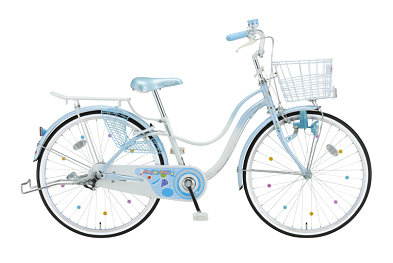 Until now she had been riding what is accepted as the standard girls bicycle in Japan, pictured below. Miyata Fruit Salad Girls Bike. While its no sports car, it has a number of redeeming features which make it perfect for a 10 year old girl in the city. For example a basket for carrying luggage is much more practical than having to use a backpack, which holds less, encumbers your movement and makes you all sweaty in the summer. Also the built in lock means when you pull up to park your bicycle is locked in seconds without your hands getting covered in grease. With the mountain bike you have to carry a lock, remove it from your backpack, handlebars or frame before threading it through your wheel most likely getting dirty in the process. 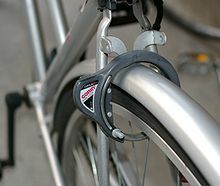 A practical bike lock for Japan. Then there are lights. The mountain bike requires batteries, whereas the girls bike uses a dynamo. Not to mention the kick stand which is much more stable, and not an optional extra, on the girls bike. As someone from a country where cycling is recreation, not transport I've never really considered the inconvenience of a mountain bike in the city, but watching my daughter struggle with locks, luggage and cycling in a skirt I've realized that for day to day transport a regular girls bike or mama-chari is much more practical. Thats not to say we're getting rid of the mountain bike, its too much fun! We have plenty of bicycle parking at our apartment. As family of four we currently have six bicycles parked downstairs and one on our 4th floor balcony.